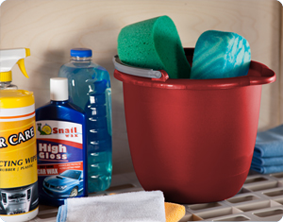 Fill, pour and clean with ease using the 10 Quart Spout Pail. It is designed with a large opening to accommodate a mop, along with a narrow spout for smooth, controlled pouring, helping to reduce messes and spills. The color-accented handle provides a comfortable grip surface for stable and easy transporting of the contents inside. 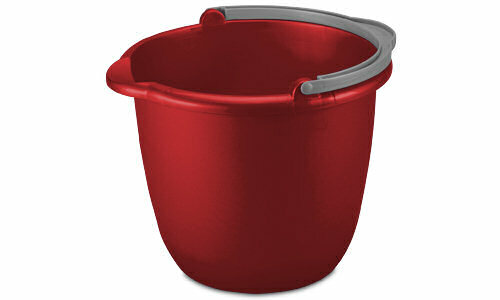 The pail offers durable construction with a reinforced rim, an easy-to-clean surface and a generous 10 quart capacity. This spout pail is ideal for a variety of basic household needs such as general household cleaning projects, washing a vehicle or for use in mopping around the home. Empty pails also nest for efficient storage when not in use. The overall dimensions of this item are 11 1/4" L x 9 7/8" W x 11 3/4" H.
Overall Assembled Size: 11 1/4" x 9 7/8" x 11 3/4"
10 Quart Spout Pail is rated 4.2 out of 5 by 9. 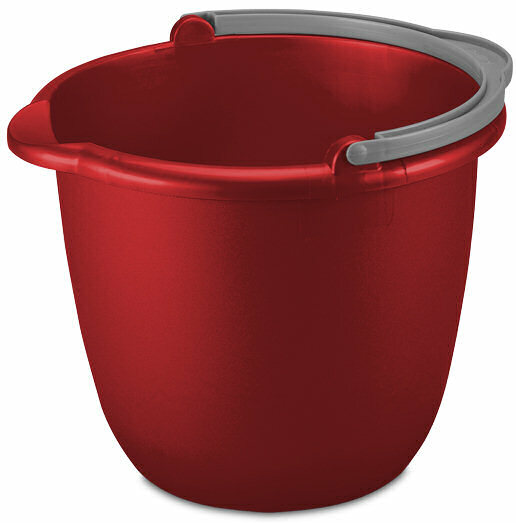 Rated 5 out of 5 by momby777 from Sturdy Pail I bought 4 of these pails when i bought a used trailer and needed something i could go from room to room with to clean. Love the handle, easy to take from one place to another, also used it to mop, hold cleaning items, even used it when i had a pipe that was leaking. After 2 years of use they are like new. Rated 5 out of 5 by karenchristy from This product is durable I have had my spout pail for years (it's blue, I don't think it even comes in that color anymore). I use my for cleaning but mostly for a mop bucket. I have other buckets/pails and the handles break and make them useless. I like the fact that the handle is sturdy, it has the hand grip on the bottom for easy pouring. Every time I go to the store I start to buy a new one (just for a color change) but then say to myself "there is nothing wrong with the one you have". If you want to save money then this pail is for you... cause it will last a lifetime (if you take care of it). Rated 3 out of 5 by gazel from Disappointed I have had this bucket for about a year and have mainly used it to carry water. It is a convenient size, comfortable to handle and pours nicely. I often noticed a small amount of water under the bucket but just dismissed it as over splash; recently the puddles seemed to be getting larger and larger and upon closer examination I saw what appeared to be a faint crack in the bottom; I pressed on the crack and the bottom split open; the bucket is now worthless. The bucket has only had light use so it apparently was defective. I expect the products I buy to last as I treat them respectfully, so, this was a disappointment. Rated 5 out of 5 by Sunshine7304 from Excellent Product I have two of these buckets that I use on my stairs. Each child has one to put their belongings in. The buckets are a good size to hold enough stuff without being too heavy, and they are easy for the kids to carry upstairs when it's time to put their things away. Rated 5 out of 5 by Tracy from Nice bucket I have had my bucket forever!!! Handle is still strong from the first day I bought it. Rated 5 out of 5 by GDub from Durable, Good Quality! I use most of the Sterilite products that I come across and I haven't been disappointed yet.